"Nine of my boys and grandsons are out on the water right now!" she beamed. 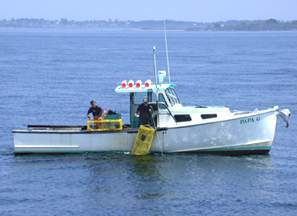 "Weve been lobstering for five generations here in Cundys Harbor. Just about all of those hundred colors are our familys," she declared, pointing to the poster with the harbors history of lobster pot float-banners. Grandma Biecrest, chief cook and manager of the Block & Tackle diner, was justifiably proud. We had just eaten her tasty "lobster rolls," butter-sautéed lobster served on lettuce-lined buns, and had been so impressed that wed decided to ask her a few questions. Fortunately she took the opportunity to share her love of Cundys Harbor with us. Her high-school-aged grandson and waiter chimed in with comments from time to time, including his finishing remark: "Ill be only the second person in the family to leave lobstering. Im going to be a Navy pilot!" Grandma Biecrest nodded, smiling knowingly. We had wanted to experience the best of Maines coastline, although we had but a few days available. Wed read and heard that the Bath-Brunswick region, including Harpswell and its Cundys Harbor, provided a good balance of easy access, beautiful islands and waterways, lobstering villages, historic towns, and top notch Brunswick hotel stays. 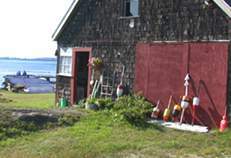 The discovery of the village with its Block and Tackle diner, the Captains Watch B & B, and many nearby attractions served up an ideal coastal Maine vacation. (Courtesy: Captain's Watch) Perched atop a bluff overlooking Cundys Harbor, Captains Watch Bed and Breakfast was a great base for our explorations. Originally built in 1862 as the Union Hotel, the B&B now has several guest rooms. Two of the rooms have shared access to the enclosed cupola for a sweeping 360-degree view of the harbor, islands, river, and bay to the Atlantic. Owner Donna Dilman served up incredible breakfasts each morning and gladly shared her knowledge of the regions attractions. Her advice helped us make the most of explorations and our interests in boating, hiking, cycling, and kayaking. Cundys Harbor has but a couple hundred residents, many of them working lobstermen who sail out from the harbor at dawns first light. While quiet and seemingly remote, it was only a twenty-minute drive to historic Bath or to the college town of Brunswick. Additionally, the harbor provided convenient access to all of Harpswell. The township consists of a western peninsula with Harpswell Center south of Brunswick, as well as a collection of islands and villages, including Great Island with Cundys Harbor, Orrs Island, and Bailey Island, all interconnected with bridges. 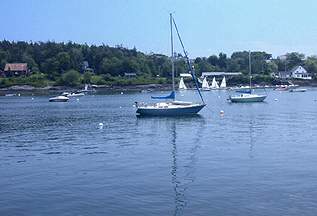 In total, Harpswell encompasses several settlements and over a hundred miles of coastline in a small geographic area. We spent part of a day in Bath, a town alongside the Kennebec River with its historic downtown, and an impressive array of architecturally interesting homes from the 1700s and 1800s. Cranes towered over the river at the still functioning Iron Works that builds naval vessels. We toured the nearby Maine Maritime Museum, impressed by the history of building huge wooden schooners on the grounds of the original Percy and Small Shipyard. A walking tour along Front, Washington, Middle, and High Streets brought us to charming shops and cafes, the Chocolate Church, now an art gallery and music hall, and homes in the Cape, Colonial, Georgian, Federal, Greek Revival, and Italianate styles. A sunset sail with Long Reach Cruises down the Kennebec River from the Maritime Museums dock provided views of six lighthouses, including the one on Seguin Island at the mouth of the fast-flowing Kennebec. A perfect end to the day was dinner at Kristinas Restaurant on High Street near Baths picturesque courthouse. A ten-minute drive west from Bath along Route 1 brought us to Brunswick. We rented bicycles and discovered the town to be a cyclists haven with its paths along the Androscoggin River. The wide downtown boulevard was lined with interesting shops and galleries, and nearby Bowdoin Colleges treed campus was a delight for exploration. The college has an interesting fine arts museum and theater with summer schedule of plays and concerts. Fortunately we came upon the weekly summer music concert on the green bordering the college and enjoyed some classical music there by the local chamber orchestra. A good find for dining was The Great Impasta, an Italian restaurant with a good selection of dishes. 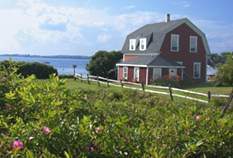 There were many opportunities to enjoy the coastal magic of Harpswell and vicinity. Hiking opportunities included a walk out to the far point of Great Island from Cundys Harbor. An incredible coastline hike on Bailey Island brought us to the rock formation called Giant Steps where Atlantic waves pounded against the shore. We took an eight-mile kayak paddle in the protected waters of New Meadow River with Seapspray Kayaking to the several islands near Gurnet Strait. Seals popped up their heads from time to time and several ospreys gave us air shows as we passed their large jumbled nests in trees along the waterway. A major highlight was the two-hour ferry cruise from Bailey Island that circumnavigated approximately fifteen islands of northern Casco Bay. When we came upon a lobster boat its two hands were hauling up pots and rapidly sorting them into keepers and throw-backs. We learned that keeper lobsters of 2-3 pounds or more are at least 14 years old. Another interesting sight was Eagle Island with its large solitary home, the former summer residence of arctic explorer Admiral Robert E. Perry. Nearby Upper Flag Island was the summer home for Perrys sled dogs. Although our schedules did not allow us the option, we noted that a great boating opportunity for our next trip would be the Captains Watch sailing charter on the 37-foot Symbion with captain Ken Brigham. An added bonus for this option is that the boat is moored near the B&B in Cundys Harbor. Down East is a name commonly used for the coastline which originated in the 1800s when New York and Boston vacationers referred to the sail downwind and eastward from their home cities to Maines desirably cooler summer climate. More recently Down East has come to refer to the far southeastern reaches of Maine including Bar Harbor. The Bath-Brunswick area with its beautiful and interesting array of islands, towns, and lobstering villages impressed us as conforming to the best Down East connotations. As we said our all-too-soon farewell to Donna and Ken at the Captains Watch and left Cundys Harbor, Harpswell, and the Bath-Brunswick region, we knew wed made an unforgettable discovery along Maines interesting coastline. Click here for details to plan your own trip to Maine's Bath-Brunswick Region.